You’ve seen giant utility towers before, and they don’t look like this. Their design really is…well, utilitarian. These utility towers are designed by the Massachusetts architecture firm Choi + Shire, and they recently won an honorable mention award at the Icelandic High Voltage Electrical Pylon International Design Competition, as well as an award from the Boston Society of Architects for unbuilt architecture. I believe that this concept project is called the Land of the Giants, and it is very aptly named. 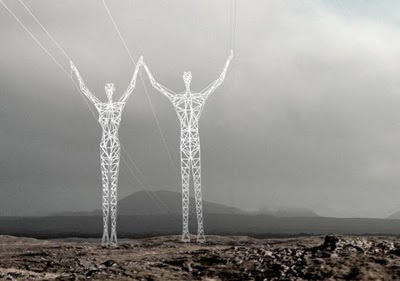 What else are you going to call two human-shaped towers that hold up powerlines? I suppose the real question is, would this look good in real life? In all honesty, I can tell you what it reminds me of: Batman and Robin. Yes, the last ever Joel Schumacher Batman film that dared to show Gotham city as this place where statues and buildings were as one. 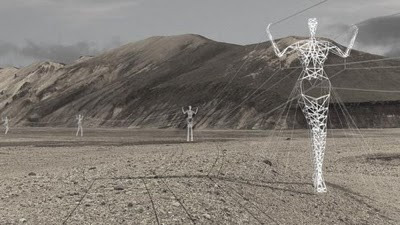 I didn’t see a single high voltage tower in that film, but it would probably look like this. I mean, do we want all of our structures to look like people? I mean, what does that say about us as people, that we like to structure our buildings after our own bodies? That is kind of crazy.